In my opinion the flagrant inequalities of our current systems of government are bound to result in all manner of suffering and eventually lead to BIG trouble. I am not talking about the odd riot and some shops being burned. There are larger concerns at stake. It’s not just a matter of an elite of wealthy people, but an elite of wealthy nations and the struggle that is shaping up to control that wealth. I have to admit, I am not only angry at internal turn of events in this country — where millionnaires are voting themselve tax breaks whilst dismantling the means by which the majority access health care, charging them for having an extra bedroom and creating a divisive culture where it is encouraged to think of pensionners and disabled people as ‘scroungers’. The unwritten contract of mutual respect between those who create wealth/ make money and those who serve the community broke down when hospitals and schools — everything in fact — came to be regarded as businesses and everything now is about money rather than about its legitimate function. I fear for the future! I read Thomas L Friedman’s article in The New York Times Sunday Review with a growing sense of helplessness and dismay — maybe I shouldn’t have read it… I had to agree with him though. 😦 and no, that’s not my usual read — I found the link in FB on a friend’s page. I am too little to put the world right — shame really ‘cos I have empathy and compassion but those are not required political qualities. And I am sure the nation will never celebrate people with empathy and compassion, doctors, nurses, teachers and the like, the way they do war-mongers, bankers and aristocrats. Tant pis. I’ll keep on saying it like I see it anyway and I know I am not alone in: WHAT CONCERNS ME written by Dr. Geraldine Green. It chimes perfectly with how I regard the demise of the woman upon whose ideas our present government patterns its actions. Do take a minute to follow the link and read it. 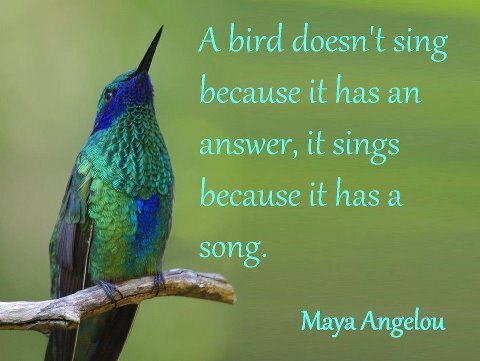 And if you take nothing else from this take the thought that neither does a bird sing because it is PAID TO.